Attach these to your ceiling to make your event space look more fun and celebratory. Featuring shiny foil swirls with dinosaurs cut outs at the bottom, these party decorations are a simple way to add adorable style to your birthday or other party. Coordinate them with other dinosaur themed party supplies and combine with solid color party decorations to create a complete party atmosphere. Each of these 30-pack hanging decorations, which are made of plastic and durable paper stock, extend to 36" long. Hang them from walls or the ceiling to add style to your feast. 15 adorable dino-card swirls + 15 double spiral. Hanging decorations extend to approx.36" long. Reusable dinosaur themed party decorations are made of plastic and durable paper stock.15PCS hanging swirl decoration features a cut-out of dinosaurs mixed with metallic whirls. Come assembled - You can directly hang it anywhere you like with the hook on the top. 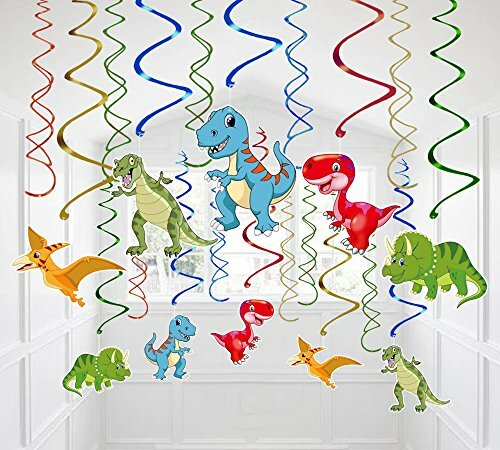 Hang from walls and the ceiling to add style to your party,and coordinate with other dinosaur themed party supplies and solid colored party decorations to create a completely festive atmosphere. If you have any questions about this product by Moon Boat, contact us by completing and submitting the form below. If you are looking for a specif part number, please include it with your message.